Happy 114th Birthday, Lawrence Welk! (3/11/1903). 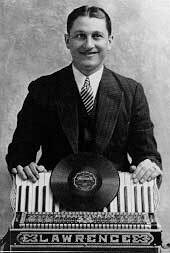 A young Lawrence Welk beams with an early, personalized accordion and one of his first records on the Gennett pressed custom label for Gurney Seed and Nursery Co in Yankton, SD, which owned the building that housed the radio station Welk performed on. Happy 118th Birthday, Miff Mole! (3/11/1898). 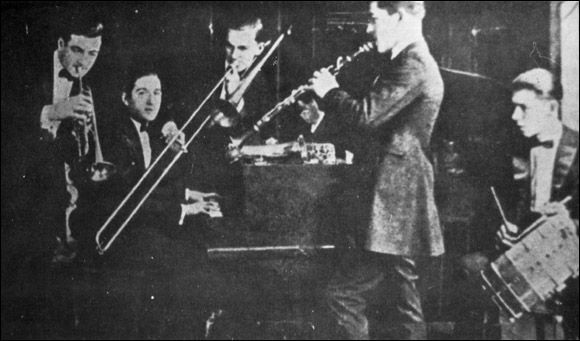 Here is a photo of trombonist, Miff Mole, with Ladd’s Black Aces members left to right: Phil Napoleon, Frank Signorelli, Miff Mole, Jimmy Lytell, and Jack Roth. This entry was posted in Gennett, Gennett Walk of Fame, March and tagged Frank Signorelli, Gennett, Gennett Discography, Gennett Records, Gennett Walk of Fame, Gurney 20341, Jack Roth, Jimmy Lytell, Ladd's Black Aces, Lawrence Welk, March, Miff Mole, Phil Napoleon, The Gurney Seed and Nursery Co.. Bookmark the permalink.